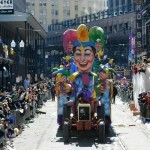 It’s the time of year when the temperatures are unpredictable, the king cake’s aplenty, and the parades are rolling. 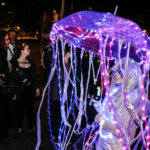 That’s right – it’s Mardi Gras season, which means it’s time to start thinking about what additions you’ll make to your purple, green, and gold style as another Fat Tuesday approaches. Lucky for us, Mardi Gras season spans over two months, from the official Twelfth Night kickoff on Jan. 6 to Mardi Gras Day itself on March 5. 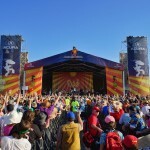 The weather can vary from the coldest it gets in NOLA to unseasonably warm temperatures reminiscent of summer. That means it’s time to round out your Mardi Gras wardrobe so that you’re prepared for anything, and we’ve got the latest in purple, green, and gold fashion to help you out. This is New Orleans, after all, where anything could happen. Jewelry and accessories are great because they can spice up a simple outfit and really take it to the next level. Trendz, with locations on Magazine Street and in the French Quarter, has the best selection of purple, green, and gold baubles that won’t break the bank. They offer a wide variety of earrings on trend that average at about $9 each. Additionally, their Mardi Gras table features anything purple, green, and gold to add to your pre-existing fashion choices, including floral headbands, sequined headwraps, gold leggings, and glitter. 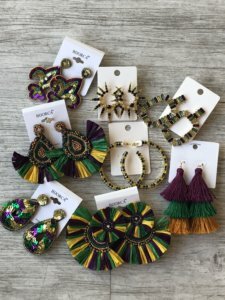 Local jewelry designer Brantley Cecilia has also released a collection of purple, green, and gold tassel and beaded earrings. They can be found online or at Jean Therapy. No other city collectively loves kitschy t-shirts more than New Orleans. And, every year, the clever designers behind our favorite local t-shirts come up with new sayings and designs to add to our pile of favorites. Schnell Studio, by local artist Lauren Schnell, make t-shirts that resemble designer labels, but with a New Orleans twist. These are perfect for those who would rather wear a more subtle shirt. Her most popular designs include an Hermès-inspired logo that stands for “hungover” and a parade t-shirt that looks like the Prada logo at first glance. Those shirts, as well as the witty “Catch Beads Not Feelings” tee, can be found online or at select boutiques around New Orleans, including Hemline. Another seasonal classic is the Perlis Rugby, which is meant to be worn oversized and loose, to keep you warm and comfortable during the cooler Mardi Gras nights. They are always in style and have stood the test of fast-fashion time throughout the years. Another great long-sleeved option is the MAMBO sweater, available with or without rhinestones at Hemline stores. Prices range between $80-100. Laya Active does it again with their Mardi Gras leggings, which are perfect for both parading and Pilates. The environmentally conscious, local brand has made a set of leggings with pastel purple, green, and gold vertical stripes to make them flattering and appropriate for any time of the year. However, New Orleanians will always know the true purpose of those leggings. Mardi Gras leggings, and their other New Orleans-centric designs, can be found online. Another multi-functional and stylish option is the Fat Tuesday Fleece from Jolie and Elizabeth. 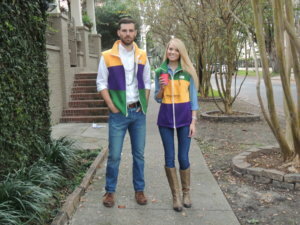 The fleece vest has quickly become as recognizable as the Perlis Rugby over the past few years, and it is always useful – regardless of whether it’s an early or late Mardi Gras. The sleeveless fleece can be layered over a sweatshirt on cold evenings and work just as well with a t-shirt when parading down the avenue on a warm Sunday afternoon. The vest is $120, and can be found at jolieandelizabeth.com. If you don’t already own a collection of wigs or aren’t consistently thinking about adding to it throughout the year, then are you really doing this New Orleans thing right? Fortunately, it’s never too late to start your collection, and they are easy to find year-round. 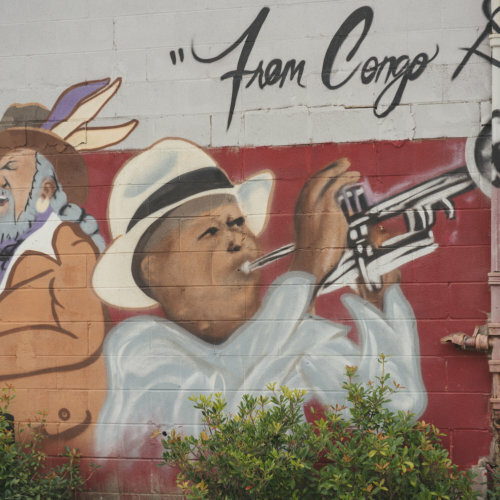 Some of the best in the city can be found at Fifi Mahony’s in the French Quarter. 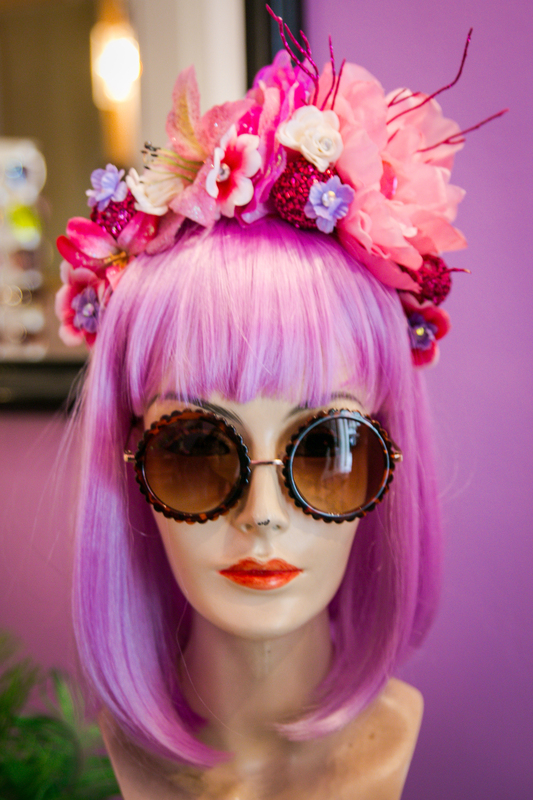 The boutique offers a variety of wigs (and prices) that range from the simple bob in most colors imaginable to one-of-a kind statement wigs, complete with a headpiece and ornate designs. If it’s a simple monochromatic wig that may or may not get doused in beer or lost during your ride, then Plush Appeal at 2801 Toulouse St. has great options of simple wigs that still look good, but will cost you less than $10. While you’re at Plush Appeal, pick up your throws and glitter. It’s basically the Costco of Mardi Gras, only way more fun. The weather may be unpredictable, but that doesn’t mean we have to sacrifice our sense of fashion to stay dry. Hemline wants to make sure of it. The rain coat and boots will be available any day now, so keep a look out for these styles coming out soon. And, let’s be honest, these options are so cute, we’ll be wearing them year-round. We’ll just let the pictures speak for themselves. Let’s not forget that Mardi Gras is just as much for the kids as it is for the adults, so teach them about the value of situational outfits while they’re still young. 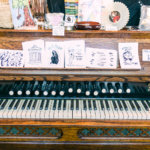 Most children’s stores throughout the city have great options for making them stay on theme with the rest of the family. Pippen Lane on Magazine Street carries a great selection for the kid that’s arguably more fashionable than their parents. This includes gold leggings, baseball tees that say “girls just want to have king cake” (because that’s a fact), glitter Native water-proof shoes, and Fringe+Co headwraps in mini-sizes for the little ones. For the more classic styles like a Mardi Gras polo dress or rugby, Mignon in the Garden District has you covered. Two Sprouts in Metairie has a slightly different selection, including sequined leggings (yes, the sequins that flip and change colors obviously, because the kids will ask) and white marching boots with the purple, green, and gold tassels.